Introduced 1975 the TI-1200 started together with the TI-1250 a great career. As a successor to the stylish TI-1500 and the Exactra line the TI-1200 demonstrated the later design and technical engineering of the TI-30. A lot of variants of this calculator followed in the year 1976. Most differed from the TI-1200 and TI-1250 only with the design of the keyplate. Don't miss e.g. the fancy LADY 1200 ot the Spirit of '76. A very interesting model in this line was the TI-1265, this one used a blue-green fluorescent display. The only known models with rechargeable batteries instead the 9V battery are the rare TI-1205, TI-1255 and the limited function calculator ABLE developed for educational purposes. Don't miss the rare CONCEPT I. The TI-1200 was the base of some experimental calculators, too. Don't miss the TI-MEC. Unfortunately this cheap calculator killed the TI-150. Marketing guys at Texas Instruments added later the TI-1400 and TI-1450, both carried under there brown housing the technique of the TI-1250. Most calculators in the TI-12xx and TI-14xx line carried a keyboard with a 6*4 matrix giving a total of 24 keys. The unnecessary keys were hidden with the metal keyplate. Remove the keyplate from your TI-1200 and you'll awake the missing Change-Sign key and a fully operational memory with 4 keys. Later the keyboard was cut to a 5*4 matrix. Find two of them in the Speak & Spell introduced in the year 1978. The basic calculator integrated circuit (IC) of this design was the TMS0952. With the TMS0972 manufacturing costs of the TI-1200 were lowered. Later models used the IC TMS0954 (TI-1260) or the IC TMS0974 (TI-1270). Only the TI-1265 differed with the calculator IC TMS1043 shared with the TI-1650. Calculators with different nameplates were sold both from Western Auto and True Value Hardware with the models Electronic Wizard M4986 resp. T-1220. In the TI-1250 section you'll find a lot of calculators using the TMS0972 calculator chip like the NS835A, Bohsei 3000, Conic EL-601 and Privileg 842M. But only one lacked the Memory, view the wonderful Barbie calculator. During the reverse engineering of the TI-1200 series for the Calculator Chips section an interesting difference between the early and later TI-1200 was discovered: During the first year on the market the TI-1200 and TI-1250 calculators carried a TMS0952 calculator IC on the printed circuit board (PCB). Later products used the TMS0972 design on the same PCB. Main difference is the ability of the TMS0952 to control displays with 9 digits, the TMS0972 ends at the 8 digit. The pictures on the right gives you the PCB's of four different calculators: A TI-1200 manufactured in the year 1975, 1976 and 1977 (from left to right). What happened? Calculator Wars! In a first step all discrete components like resistors and capacitors were removed (TMS0952 to TMS0972 evolution). In a second step the calculator IC itself was shrinked (TMS0972 to TMS0972ASP). 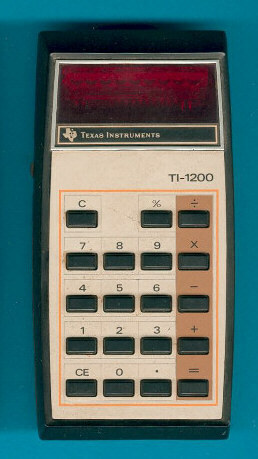 The TI-1200 is featured in the Texas Instruments Deutschland GmbH leaflets ER-1975 and ER-1976 dated 1975 resp. 1976.